Do you notice a lot of dropped calls and missed texts when you’re at home? If so, you probably need a cell phone signal booster. Nearly anyone can get them, but you might wonder if installing them is just as easy. Do you have to be an electronics wizard or home improvement guru to do it? Since I’m neither, that’s the first thing I’d ask. Well, I did some research and found out that installing a cell phone booster it’s not extremely difficult. How do I know? Well, I gave it a try and was successful. And if I can do it, I’m certain that you can, too. To make it easy, I’ve shared the five steps of cell phone booster installation. Before we get started, let’s set some ground rules. I’m assuming that you own your home and are free to install an antenna on your house. If you live in an apartment, condo, or part of a homeowners association, you should check your HOA guidelines before starting any project. (According to the OTARD rule, any antenna smaller than 39.37” in any direction can be mounted upon most roofs without HOA permission. This doesn’t apply to drilling into your roof, though.) Also, the advice given here is not that of a professional technician and is meant for information purposes only. Before you mount your antenna, you need to know where the best signal is at your home. We’re going to assume that your carrier has a cell phone tower in your area. With that out of the way, here’s a quick and easy way to get an idea of the signal that’s available outside your home. Just walk around your house with your cellphone and pay close attention to the bars on your phone. 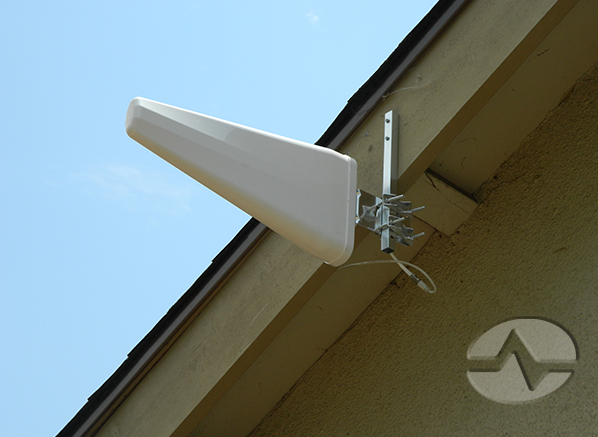 Generally speaking, the side of your home that provides the most bars is usually the best place to put your cell booster antenna. Note: Cell phone bars are a very subjective measurement. Two bars for one carrier could be one, three, or four bars on another. That’s because there is no industry standard on how a bar is measured. What having bars on your phones tells you is that you’re getting some service from your provider from that direction. My colleague Stuart Sweet recommends that, if you don’t have an Android phone, getting an inexpensive pre-paid phone and used the Signal Strength app to find cellular and Wi-Fi signal in graph form. He assures me that iPhones are nearly useless for signal testing. Since you’re only working with one carrier, you should be safe trusting that the side of your house with the most bars will provide the best signal connection for your phone and devices. Check out this companion post for a more detailed look at how to find the cell phone towers in your area. In it, I help tech beginners like myself through the more detailed ways of finding your carrier’s local cell phone signal tower. Most experts recommend putting the antenna on or near the edge of the roof and pointing it away from your house and toward the nearest cell tower. This meant I’d have to get up on my roof, which was a problem. You see, I have this thing about heights. I don’t want to say it’s a fear, but it’s definitely a fear. Despite my issues, there was no other way to mount my cell booster antenna. Like it or not, I had to break out my ladder and climb up there. My cell phone booster, which I got from Solid Signal, came with mounting hardware that made this job easy. I just followed instructions on where to mount my antenna. This is where the Phillips head screwdriver and adjustable wrench came in handy. Within minutes, I had it secured to a safe spot on my roof and pointed toward the direction of the cell phone tower in my town. (It was also the direction where my phone had the most bars.) I finished this step by connecting one end of the coaxial cable to the outdoor antenna. When it came to this third and important step, I was a little unsure of myself. It required drilling a hole through my house to run the other end of the coax cable inside and down to the indoor amplifier. Fortunately, my brother-in-law Adam has some home improvement experience and he was willing to give me some help. If you’re a little unsure of yourself in this step, I recommend reaching out to a friend or family member for some advice. It couldn’t hurt. Michigan has a lot of rain and snowfall, so I used a wall bushing to help weatherproof the hole. After double- and triple-checking the route, I safely drilled the hole. I then inserted the wall bushing through the hole, and ran the coax through that bushing until reach the room where Mrs. Buckler and I keep our cell phone amplifier. That end of the cable secured to the amplifier itself as easily as the other end connect to the antenna. What if you can’t drill a hole into the side of your home? This could be the case for people who rent or have strict homeowners association guidelines. If this is you, you can still have a cell phone booster in your home. You can always use a window-entry cable instead of drilling. This specialized extension cable connects your outdoor antenna to your amplifier by running beneath a close window. To do this, you need to know where the signal is needed most inside your home. For me, that was easy: our family room. That’s where Mrs. Buckler and I make and take all our calls. The laundry room is practically a Faraday cage. (That’s a metal cage that prevents certain kinds of electricity and signals to get through.) Plus, the sound of our dryer isn’t conducive to good conversations. If you don’t know where to put your antenna, here’s a hint: it should go where you struggle to get signal. Once you know where that spot is, mounting the indoor antenna isn’t too difficult. Here’s something important you need to know. Cell phone booster manufacturers recommend putting the indoor antenna on the wall or ceiling of the trouble area. You want it to be at least 15′ vertical, or 30’ horizontal from the outside antenna. This distance prevents oscillation, which is a fancy way of saying that the antennas are two close, which shuts down your amplifier. When it comes to installing your indoor antenna, be sure to follow the manufacturer’s instructions. If you have a handyman or handywoman in the family, you can always ask for their help. Bottom line: it shouldn’t be too hard to get that indoor antenna mounted inside your home. Once it is, you just connect the other coax cable to the antenna and the amplifier. 5. Time to Power Up! Once both antennas are installed and connected to the amplifier, it’s time to turn it on. Just plug in the amplifier’s power supply into a nearby wall outlet. The unit will sync up and show green lights. This means you’re good to go! Now it’s time to enjoy all the benefits of having boosted signal in the part of your home where you need it most. What happens if you need to make any adjustments after you’ve installed your cell phone signal booster? There’s no need to panic. Just unplug the power supply for five to 10 seconds then plug it back in. This reboots the system much like when you reset your WiFi router. There are businesses that specialize in installing these devices inside your vehicle. The money you spend to have this done is nothing compared to what you’d spend to have your car fixed. Then there’s the annoyance of having to find another way to get to and from work while your car is getting fixed. These are good reasons to have a professional install your vehicle cell phone booster. The whole purpose of a cell phone booster is to improve your wireless experience. They do this by reducing dropped calls, missed texts, and slow or interrupted data. What a cell phone booster can’t do is help you if you’re unhappy with your wireless carrier. Fortunately, Solid Signal is an ATT Preferred Dealer. This means we offer ATT wireless plans and all the latest cell phones. We also have a variety of sales and promotions to help you save money on your cell phone purchase and monthly rates. To learn more about our current offers and promotions, connect with a cellular expert at 877-312-4547. Can using a cell phone cook your brain or give you cancer? What’s the longest run you can have with a cell booster? Should you mount an antenna on the roof of your RV? What is a “swedged” mast?